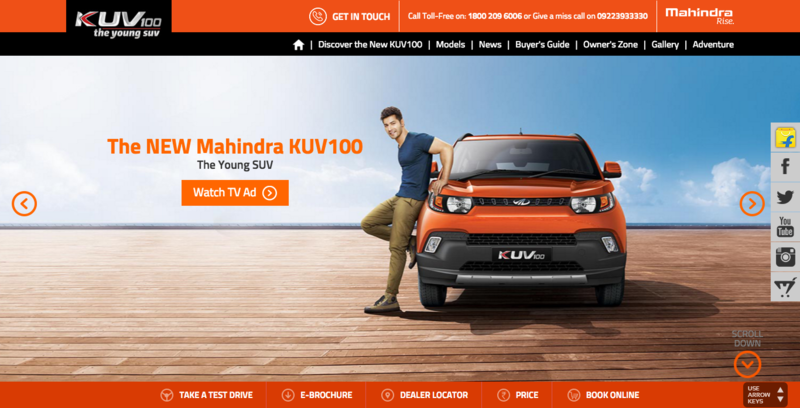 M&M Ltd., India's leading SUV manufacturer, launched the Mahindra KUV100 for the young audience. 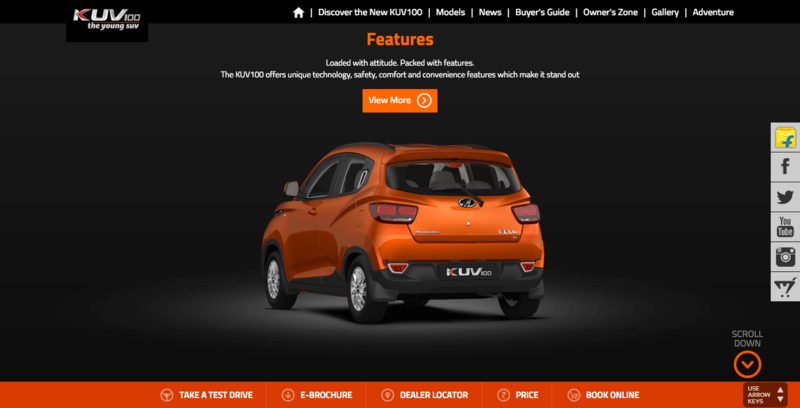 The KUV1OO highlighted features of the car in a parallax website, enhancing the cutting-edge features with a walkthrough of the interior as well as the exterior. Mahindra has always been a trendsetter in the Indian automotive industry. 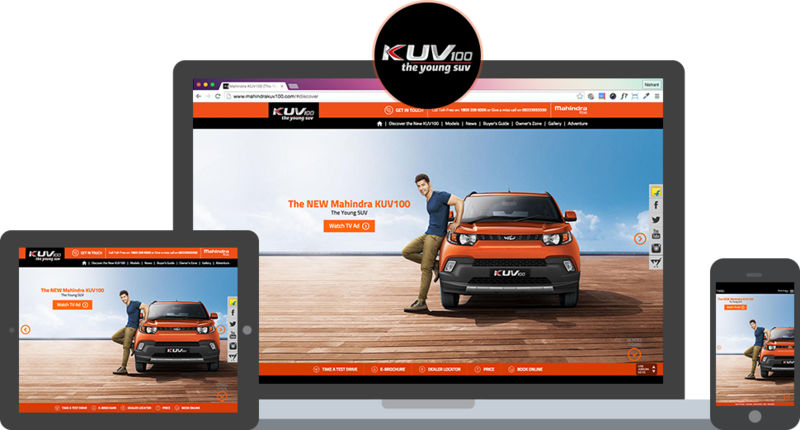 With the launch of KUV100, the website was demanded to be young and trendy to be in sync with the young audience. 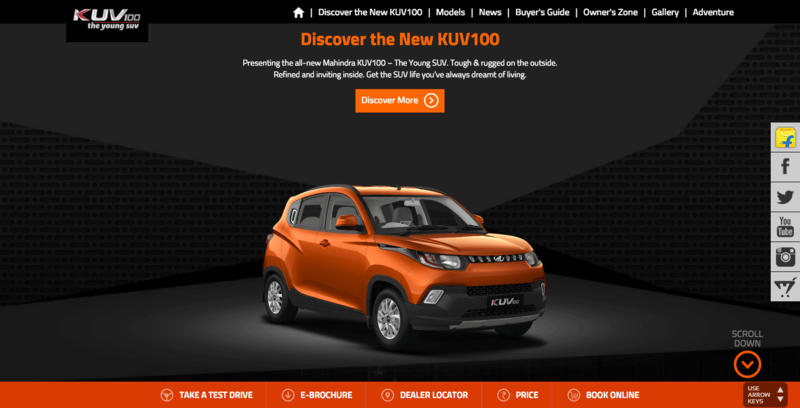 Mahindra KUV100 became the fastest selling compact SUV, garnering over 34,000 bookings only through digital promotions. The digital campaign went on to be successful with their first print ad launching the vehicle, coincided with their announcement to close vehicle bookings. 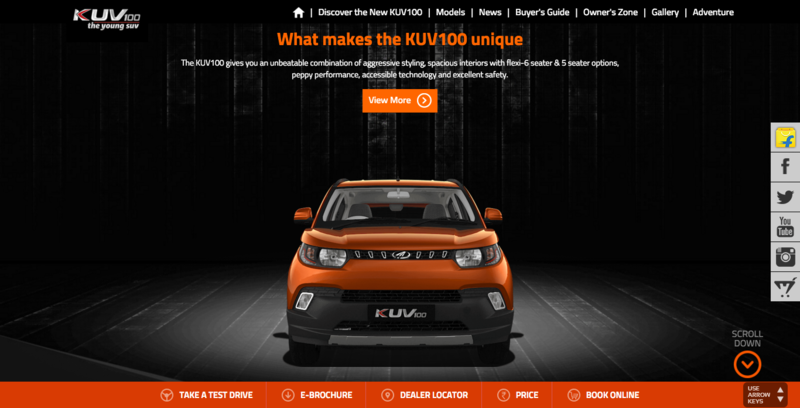 We needed to set a higher benchmark for the new breed – the Mahindra KUV100. 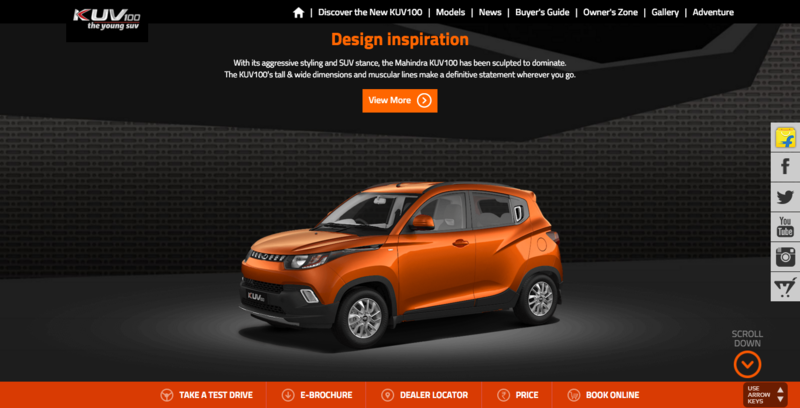 Since Mahindra stepped into a new segment, the design and interface of the website had to focus on all the new features displaying the car in a unique manner. We wanted to keep the website minimalistic and not text-heavy. Varun Dhawan was placed on the home page to get more attention of the young and restless, once we had their focus on the page, the next step was to share the information smartly over the website. This website was made to be neat, classy, clutter-free, user-friendly and device compatible. 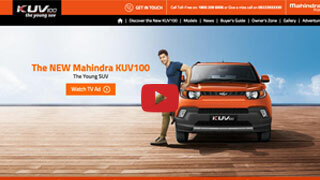 A unique HTML 5 website was created, featuring Varun Dhawan and the vehicle upfront. 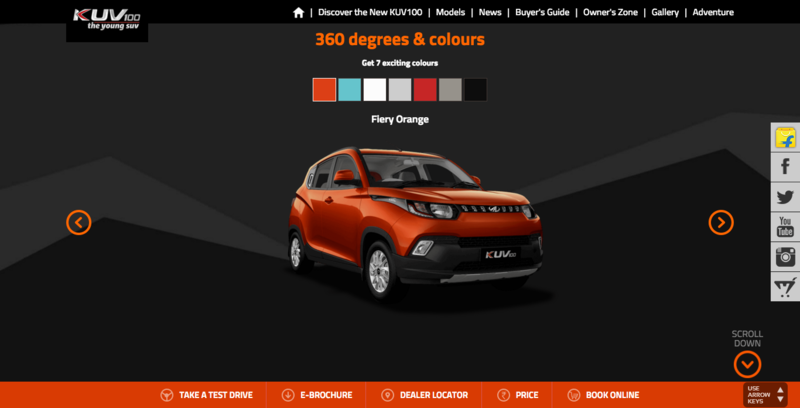 We provided a journey to the users where they could easily see different perspective of the vehicle just by scrolling down the page. We chose to showcase important features by blending in visual detailing of the car with its utility and backing up with precise text. The overall presentation of the website had the taste of the young audience, which was put in an adventurous way, and simultaneously make it look majestic! This was a vertical scroll website, where all main features were put upfront on the homepage, thereby making the user interface easy and simple. 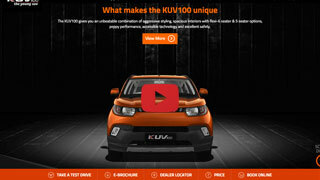 The website had 12,35,000 visits in the first week with over 65,000 test-drive enquiries.